Gauhati University B.Ed Entrance 2018, How to Online Apply, Application form fill up availability, B.Ed entrance Syllabus ,Eligibility,Course Fees, Admission : Hello Everyone. We , the AssamCareer Team is happy to inform you that Gauhati University has published official notification for GU B.Ed Common entrance Test 2018. According to the latest B.Ed notification, Gauhati University B.Ed. Common Entrance Test (GUBEDCET) for B.Ed. Course, 2018 is scheduled on 22/07/2018 (11am to 1 pm). To apply to the GU B.Ed Entrance 2018 , candidates need to fill the online application available at Gauahati university official website from 03.07.2018 to 12.07.2018. [Exam Date & Apply Date postponed : Check the latest news at the end of this post] In this whole article we will discuss in details about Gauhati University B.Ed Entrance Test 2018 , how to apply online, Gauhati University B.Ed entrance syllabus, course fees, eligibility for B.ed in Gauhati University and each and evry aspects of Gauhati University B.ed Admission 2018. 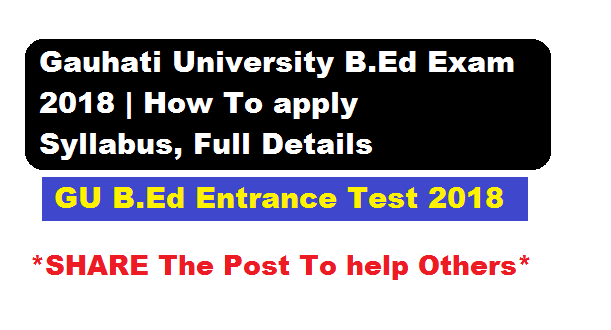 2 What is the Eligibility Criteria for B.Ed in Gauhati University B.Ed Entrance Test 2018 ? Now we will discus more details regarding GU B.Ed Entrance Test with number of seats, eligibility , course & fee structure, syllabus for B.Ed entrance test. Total No of Seats : 3450 nos. What is the Eligibility Criteria for B.Ed in Gauhati University B.Ed Entrance Test 2018 ? You must be looking for the Eligibility for B.Ed Degree in Gauhati University B.Ed test 2018. Well, As per NCTE norms a candidate may be allowed to appear in the GUBEDCET-2018 provided that he/she has passed the B.A / B.Sc. / B.Com. or MA/ MSc/M.Com or equivalent degree programme form a recognized Board/University with at least 50% marks (or 45% for SC/ST/OBC category candidates). Well , after knowing the Eligibility Criteria for B.Ed its time to look upon the Syllabus for B.Ed in Gauhati University B.Ed Entrance Test. Following are the syllabus and Mark wise break up for each topic in B.Ed entrance test 2018 for Gauhati University. i) General English (Vocabulary, Tense, Voice, Narration, Prepositions, Correction of sentences, Comprehension): 30 marks will come from this category. ii) General Knowledge (Indian History, Indian Polity, General Science, Current affairs): 30 marks will come from this category. iii) Test of Reasoning and Numerical Ability: 30 marks will come from this category. iv) Current Indian Education (Issues and Policies) National Policy on Education 1986, Universalization of Elementary Education – Right to Education, Sarva Shiksha Abhiyan (SSA) Secondary Education – Rastriya Madhyamik Shiksha Abhiyan (RMSA): 10 marks from this category in B.Ed Entrance Exam in Gauhati University 2018. We urge everyone to remember the following dates and timing which is very important for Gauhati University B.Ed aspirants. Issue of Admit Cards (online): 18/07/2018 onwards. 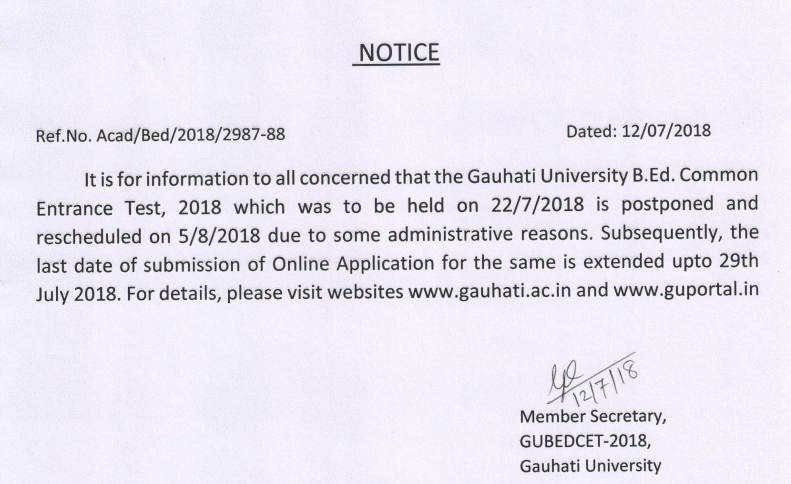 Date of central counselling at Gauhati University: To be notified after declaration of result. We will now discuss about GU admission process for B.Ed 2018. Candidates will be allotted seats into the various affiliated/permitted B.Ed. Colleges on merit basis through ‘Counselling’ conducted centrally at Gauhati University. The candidates shall have to get themselves admitted in their allotted college within 5 days. The colleges will submit a vacancy list within 2 days from the last date scheduled for reporting. On the basis of vacancy list submitted by the colleges, the 2nd counselling process will be completed which will also include transfer cases from one college to other. one answer will be the correct option. 2. The test Booklet and the OMR will be in English. 3. The test will be OMR based. 4. There will be no negative marks for wrong answers. and the marks obtained in the GUBEDCET-2018 in the ratio of 30:70.
total score will be: 21+38.5=59.5. total score will be: 21+49=70. total score will be: 15+63=78. 6. Reservation and relaxation policy will be as per existing GU rules. 7. Application and Entrance Examination Fee: Rs.1000.00 + Bank Transaction Charge. 8. Anything not covered by this guideline will be decided by the university authority at appropriate level.